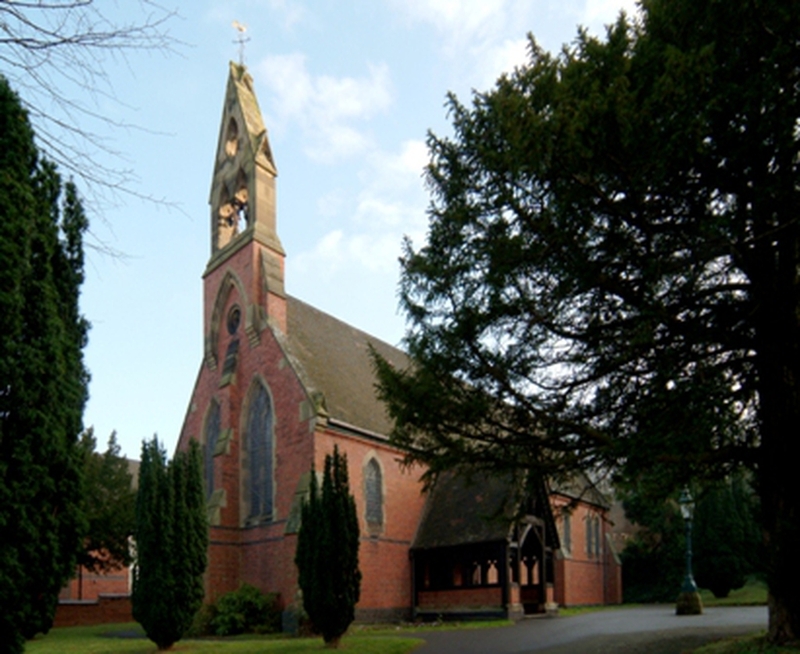 Wilden All Saints is a small brick-built Victorian church which was opened in 1880. It has strong connections with the Arts and Craft movement and all 14 stained glass windows were designed by Burne-Jones and produced by the Morris Company. This is because Edward Burne-Jones was the brother-in-law of Alfred Baldwin who commissioned the church. Alfred owned the then nearby flourishing ironworks which employed most of Wilden's inhabitants. Alfred married Louisa McDonald, whose sisters had married the afore-mentioned Edward Burne Jones, (Georgiana), John Lockwood Kipling, (Alice, mother of Rudyard)and Edward Poynter, (Agnes). Alfred and Louisa had just one son, Stanley who notably became Prime Minister of England, serving 3 terms. Apart from the windows, Wilden also has a set of Art and Crafts fabric hangings, a gold-thread altar frontispiece designed by William Morris and an illuminated prayer book with embroidered cover. These are all on display during regular Open Days. The treasured Baldwin silver is brought out ofthe bank vaults for special occasions. The wooden fittings and Willis organ are all original to the church, maintaining the Victorian ethos. The large churchyard is home to a variety of wildlife, (woodpeckers, hedgehogs, squirrels, overhead buzzards etc. ), and is enhanced in springtime by the bank of wild daffodils. A number of 'interesting' graves include those of the Baldwin ancestors, (not Stanley), and a local foundry worker killed by the cannon fired to celebrate Alfred Baldwin's success in the Parliamentary elections. The grave of Thomas Jones is a focal point each year on July 15th. Thomas was a local benfactor who left a considerable amount to Wilden School. Each year on his birthdate the schoolchildren gather around the grave with posies and sing happy songs as he requested. The church community is very active. Concerts and other events take place regularly and are well supported. An Emmaus Group meets on a regular basis. Details are advertised on our outside noticeboard, in newsletters and on websites.